The western ranch style setting at Angler Mountain Ranch is nestled between open protected lands with private access to the areas lake for fishing and boating. This new development holds 62 homesites while preserving half the ranch for open land providing natural habitat protection. A mixture of single-family cabins and duplexes are centrally positioned, while designed to preserve fantastic Gore and Ten Mile Range views from each individual homesite. Single-family, owner build home sites are available starting at $235,000, which are situated near the pond end and the farthest end of the development property! With plenty of protected land to roam about, owners in the Angler Mountain Ranch Subdivision will enjoy close proximity to trailheads, lakes and streams. Take the quick trailhead connection located out the back door to hike the stunning Ptarmigan Trail or cast a line in a gold medal trout stream right next door. Anger Mountain Ranch is the perfect place to settle down for both the outdoor enthusiasts and for those seeking some peace and quiet. After a long day, relax at the private clubhouse overlooking the lake while reminiscing on the days great adventures! Some of the most popular winter activities in the area including but not limited to; world-class skiing and snowboarding, Nordic skiing, snowshoeing, dog sledding, snowmobiling and ice skating. Silverthorne is situated in close proximity to four major ski resorts including Copper Mountain, Keystone, Breckenridge and Arapahoe Basin. For those staying off the slopes during the season, Silverthorne Outlets boast over 125 different stores, suitable to impress each individual shopper! In the summer months, outdoor recreation is favorable in surround areas such as Ptarmigan and Eagles Nest Wilderness. Unlimited hiking and biking trails are centrally located, including more strenuous mountain climbs and lax afternoon strolls around the lake. Anglers find excitement from great trout fishing in the Blue River, while fly-fishing is the most desirable fishing method in this area. 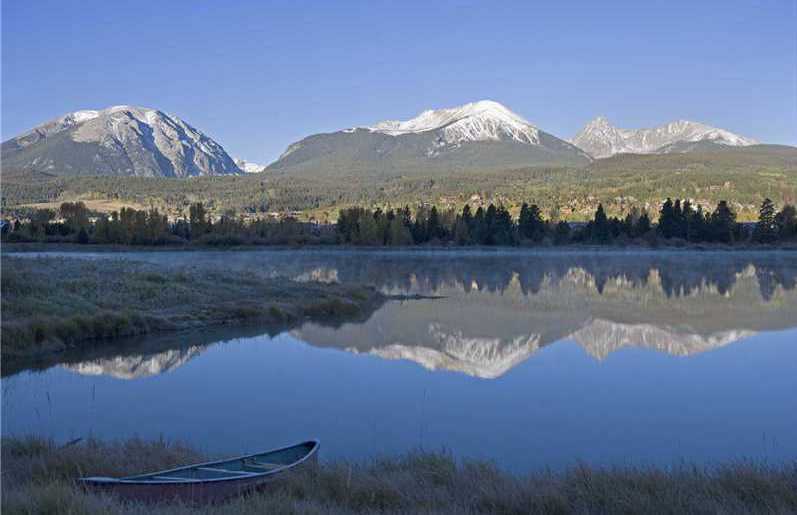 Two reservoirs, Green Mountain and Dillon, also rest in Silverthorne and are popular for both fishing and boating. White water rafting opportunities are just a short drive from Angler Mountain Ranch Subdivision and scheduled transportation is always available! Make Angler Mountain Ranch in Silverthorne your mountain residence today! If you would like more information about this spectacular subdivision, the professional team of brokers at Real Estate of the Summit will be more than happy to assist you with all your Summit County real estate needs. Call our office at 970-453-1450 or fill out the contact form below and we will get in touch with you.